Mom, the Intern: A little bitty baby. This evening, I came across a dear friend's blog. She just had a baby in early January and he is darling. 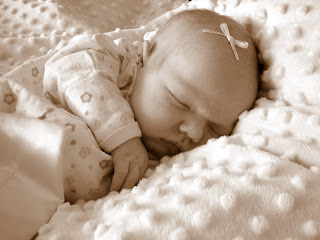 I looked at the pictures of her precious newborn, cooing over his gummy smile and squishy face. Then, out of nowhere, a green-eyed monster attempted to burst from my abdomen and eat the computer screen. Jealousy. It takes over when you least expect it. Now, why in the world would I be jealous of someone who has a newborn? Hello, Jenna. Don't you remember when you got puked on 3-5 times a day, spent most of your time bouncing in order to silence the screaming, and walked around in a bra-less haze from lack of sleep? REMEMBER? Remember going days without showering, changing explosive diapers, tiredly lugging around a 20-pound car seat and dissolving into tears when you couldn't find the binky? Oh, how soon we forget when our eyes fall upon a sweet newborn. As I begin the downhill stroll of my journey towards college graduation, I can't help think about the NEXT BABY. When do I want to throw out the birth control? Some days, I am tempted to flush it down the drain immediately. Other times, I want my tubes tied. 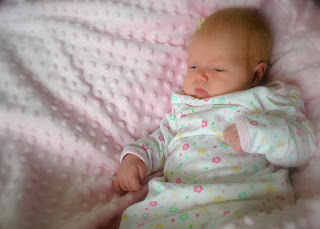 In the meantime, I will just enjoy new motherhood through the blogs of others. ...a little girl will be looking back at you. I'm installing toothpicks in my eyelids as we speak. When you're 9 months pregnant and ready to kill somebody unless they get this baby outta you, you're thinking NO! NO MORE BABIES! EVER! Then, a little while later, you see this beautiful, sweet, tiny thing and all it takes is one sweet little smile or a yawn and you've forgotten everything. Haha!! I wonder why when I see my friends with babies get all goo goo over newborns... to me they're all the same! And as soon as I read the words "I'll do things differently THIS time around" I had to rush over here an see if you had an announcement... haha. I was expecting "the next" not... "This" But I know how you feel :) There's a green monster living in my stomach too! Oh Jenna! I feel the same way. Somedays I want to sabotage the birth control and throw caution to the wind. But then I see screaming babies in church and I decide not to. However, little babies are addicting! It IS amazing how quickly babies grow up, but it is definitely a pleasure to watch! There is just something about a new baby that makes me feel calm. For me it's a little different. It's all about kittens! If it wasn't for Brian's sensiblity, we'd have about 500 kittens/cat by now. This is true.